What are Progressive Jackpots and How Do They Work? Progressive jackpots are becoming more and more common within the world of gambling. Both online and mobile casinos, as well as their land-based counterparts, are employing the inclusion of ‘Progressive Jackpots’ as a main draw in order to encourage your business. But just what is a progressive jackpot? You may feel foolish for not knowing, but you shouldn’t. It was never something that was really explained to anyone, rather just dreamed up by a rather clever marketing director somewhere in Downtown Las Vegas – at least that’s how we’d like to picture it! In short, a progressive jackpot is a jackpot which gradually increases as time goes on. The more players who try and fail to cash out the jackpot, the more sky high the total amount of cash up for grabs becomes. It’s a pretty simple format, though extremely effective in its ability to reel in players from far and wide. Unsurprisingly, progressive jackpot games account for a great deal of the business any casino does year on year. Which Games Feature a Progressive Jackpot? 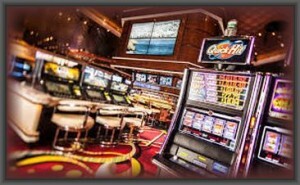 Typically the only games which feature a progressive jackpot are either slots or video poker machines. There are several pretty solid theories as to why the progressive jackpot format is so popular among modern gamblers. Among them is the obvious novelty factor: the fact that progressive jackpots are beamed across the floor of all casinos real world and virtual via big bright lights certainly helps keep them in the limelight. People always want to be involved with novel things – particularly when partaking in something like gambling. Furthermore, the constantly upwards-creeping meter which tracks the jackpot amount illuminating the place up helps draw in the revellers. Numbers on a screen reflecting a very real and in the minds of all players very winnable jackpot are hard to ignore.